Availability for this one-day event is extremely limited. Advance reservations are required. Please call our office at (918) 986-9986 to see if your preferred time slot is still available. 1. Only parents or legal guardians may register on behalf of their children. A signed consent form (at the top of the forms page) must accompany athlete if the parent/legal guardian is not present with minor. The parent or legal guardian must also complete the new patient form and social media/photo release form (found at the bottom of the forms page) prior to the appointment time. These forms can be found under the “New Patients-Forms” tab. 2. Please eat and drink minimally for the 2 hours prior to your mouthguard appointment. 3. If you are interested in bringing a large group/team, please call our office in advance for team registration. 4. 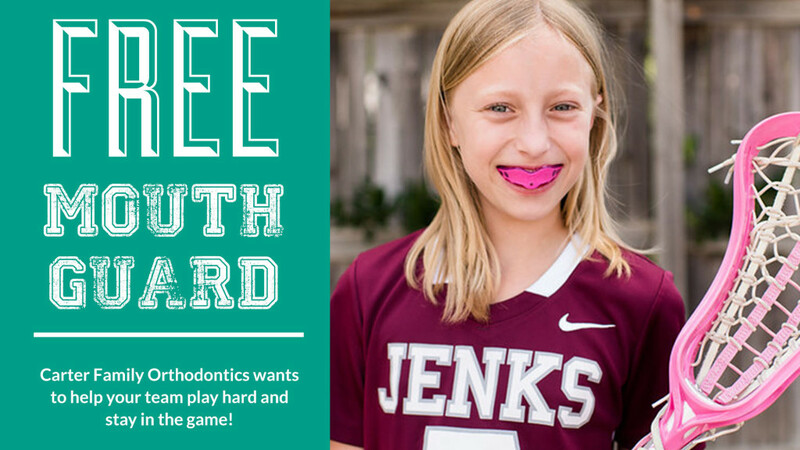 Mouthguard Day is FREE to the community; you do NOT have to be a current patient of Carter & Higgins Orthodontics. 5. If you’re unable to make your scheduled appointment, please let us know in advance so that we may make the appropriate schedule changes and look for another spot that might work better for you.